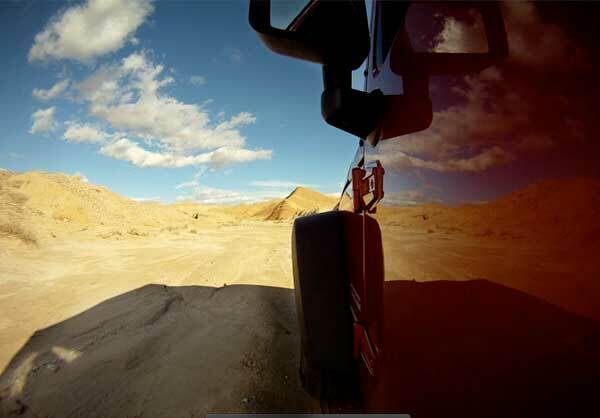 The stretch of California desert known as Anza Borrego has a lot of similarities with parts of the Sahara and as such is a perfect place to work on the terrain recognition skills that will help us navigate off-road without a GPS during the Rallye Aicha des Gazelles. At first glance the landscape looks indistinguisable, with just the far off mountains to provide an overall sense of direction. 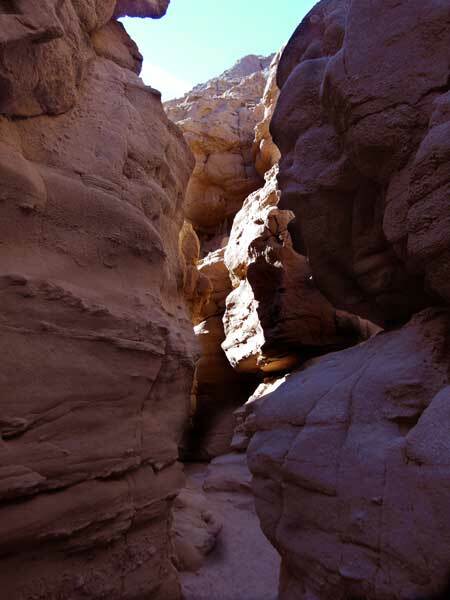 But the Anza Borrego desert has lots of hidden gems tucked in between the folds of rock and sand. 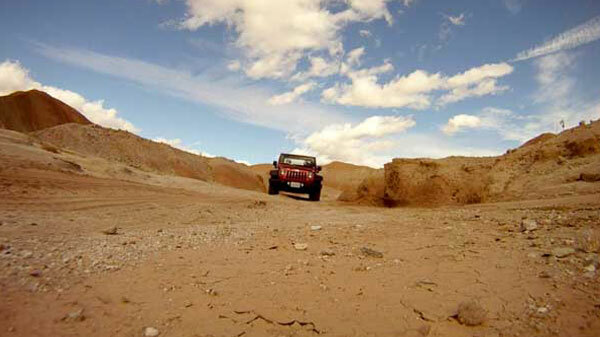 It is a paradise of slot canyons, rocky buttes, sandy dry washes and all kinds of exciting terrain. I am discovering it on foot with Bill Gookin, of Orienteering USA, who is teaching me to identify terrain features we can use to navigate the desert. Gookin is a specialist in land navigation and founder of the San Diego Orienteering club. The sport of “orienteering” consists of plotting a route, then using a map and compass to locate marked control points along the course in the shortest time possible. This is exactly the type of thing we will have to do in the Rallye, but there it will be on a much larger scale and we will be in the Jeep. Gookin has been organizing orienteering events in this area since 1969 and has personally mapped much of this desert himself. Today we are working off one of his “orienteering maps,” — an extremely detailed depiction of a very small area that we will cover on foot. Gookin hands me a board with the map taped onto it, then begins to point out features, matching it up to the landscape in front of us. I need to learn to recognize details — spurs, knolls, reentrants, saddles, and so forth — that define the three-dimensional space. It is easy to identify these features on paper with clear contour lines and obvious edges. However, in the real world those lines represent gradual ascents or descents that are not always so easy to recognize. And it gets even more confusing because there are land features we see that are not shown on the map because they are smaller than the height represented by a single contour line. Still, there are plenty of clues in the map, and Gookin is teaching me to “read” beyond what is there. For example, the fact that streams start to converge and come together on the downward slope, gives us a quick indication of whether something is going up or down when we look at the map. Walking off the Jeep trail into the desert, I begin to look for the first “prominent” feature from the map, which is really just a low sloping bit of earth protruding in our direction. Scanning back and forth between the map and the landscape, I can’t forget to also look at the ground in front of me so that I don’t trip over a rock or fall into a hole. Slowly I start to get the hang of it, and am encouraged as I correctly identify one feature after another along the way to our “destination” — a single small hilltop in the middle of “nowhere” out here in the desert. As I begin to comprehend the basics of terrain recognition, Gookin adds route-finding strategies into the mix. Still working on the micro-scale of the orienteering maps, he shows me how to evaluate options. Plotting our start and end points on the map, we then draw a “straight-line” between the two to determine the ideal distance. However, we still need to decide the best way to get from where we are to the place we want to be. Gookin points out that we may not want to climb up and down over several steep hills to go “straight” when there are other options–especially as we are doing this on foot. Tracing his finger along a line on the map, he sketches a less arduous route along a single contour, then another possibility that follows a ridgeline. A good “rule” is to start with the place we want to get to on the map, and work back to our current position looking for the best path available. We set out along the ridgeline “route,” making our way relatively effortlessly. Pausing midway, Gookin tells me to stop and look carefully at the earth beneath my feet. We were actually walking on an 800-year-old Indian trail. Squinting and looking off into the distance, I could see the traces he was talking about, just subtle indications in the way the rocks were dispersed, making this a bit flatter, like a “path” of sorts — it was just naturally the place a person would choose to walk. For hundreds of years people just took the “easiest” path along the ridgeline, and even though it is not a “trail” the earth itself seems to remember. Moving on to maps of a larger scale, we begin combining land navigation with driving for a more realistic simulation of what we will have to do during the Rallye. Spreading out the larger map on the hood of the Jeep, Gookin reminds me of an important difference in maps of this scale — there are many more terrain features that will not appear on the map because a single contour line now represents 40 feet. I am going to start having to more precisely assess heights and distances now, and I will have to do it while we are rolling. The first exercise would be a relatively straight route running through Blown Sand Canyon, a trail with loose sand somewhat similar to a north African “piste.” Focusing on driving the trail, while simultaneously paying attention to the distance travelled, I was looking for the “feature” I had identified on the map that would tell me where to turn once the canyon opened up into a larger wash. This was an unexpected question, as I knew he wasn’t “lost.” Tentatively taking the map, I realized he wanted me to pinpoint our exact current position from just the terrain. As I looked at the lines and shapes on paper, I realized I did have a rough idea of where we were. I simply had to “narrow it down,” by looking at the landforms on the map and matching them up with what I see in three-dimensions around me. I surprised myself when I somewhat confidently pointed to a precise spot and Gookin confirmed my choice. He explained that it would be helpful to “track” our progress on the map as we go, so that when we need to determine our exact position, we already have it narrowed down, having confirmed the terrain features as we passed them. We repeated the “where are we” exercise a number of times. With very unique and clearly separate terrain features to use as waypoints in this canyon I was doing pretty well. Then, coming out into the San Filipe Wash, the map identified a Jeep trail going off to the left just before we should reach the main wash trail. I couldn’t find it. It was gone. Or we were lost? The map we were working off was from 1969. He used this opportunity to stress the importance of relying on the terrain features, which are essentially stable, as opposed to man-made features which can change radically over time. Next I had to identify a specific position just after the entry way into Buttes Pass, but now there were many similar landforms, and picking out the exact one we had targeted on the map was difficult. I had to start referring to other terrain features that I should be seeing nearby and to relative distances between the landforms and the “trail.” I was really learning to see in a new way. We were driving in a winding “trench” of sorts. Each turn revealed more surreal landscape and it was exciting to be “trail blazing.” Only a few tracks had been here before us. As the trench narrowed with increasingly tight s-curves giving us less room to maneuver the route became more difficult. Rock spills blocked the “road” and I got a “bonus” workout in technical driving, picking lines over the obstacles, and scouting out the passage. Gookin could see that a few of the tracks turned back here. 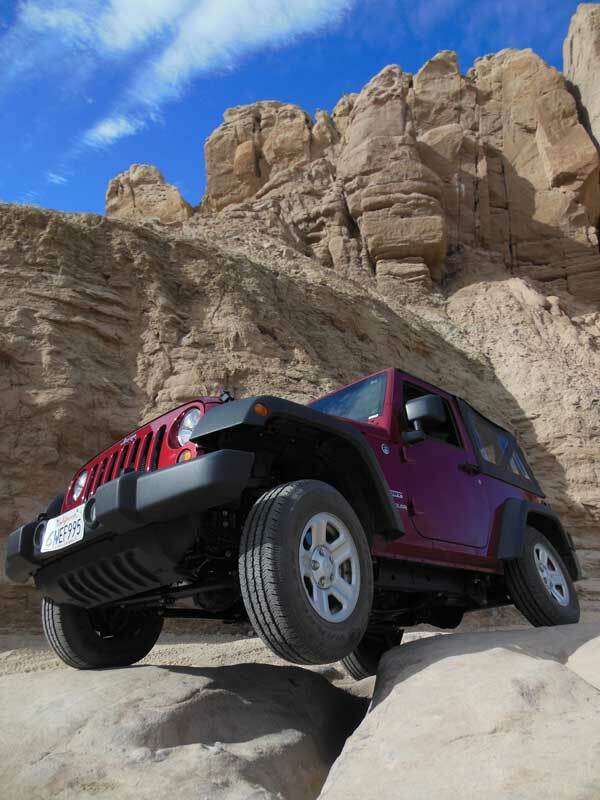 We got over that bit without incident continuing across otherwordly terrain full of excitement, but equally aware that we too might have to turn back at some point if the terrain became too tough for a stock Jeep with street tires. When the “turnaround” point eventually came, it wasn’t even a disappointment, as I got to practice using the “breadcrumbs” to retrace our own tracks out. We were in the “middle of nowhere,” yet I could confidently determine our exact GPS coordinates! 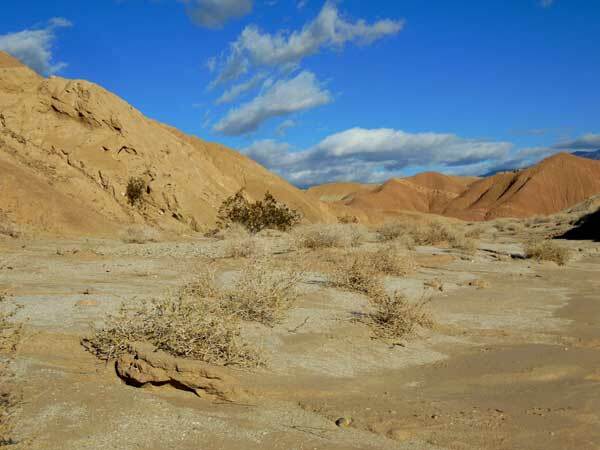 Anza-Borrego is a state park located within the Colorado Desert of southern California. 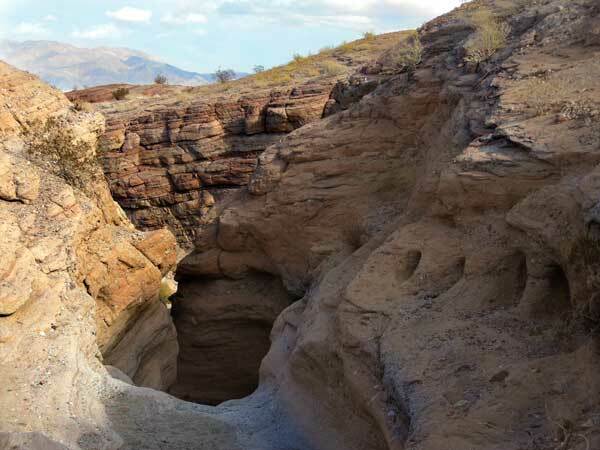 The great bowl of the Anza-Borrego desert is surrounded by mountains, with the Vallecito Mountains to the south and the highest Santa Rosa Mountains to the north. Named for the 18th-century Spanish explorer Juan Bautista de Anza and borrego, the Spanish word for bighorn sheep, the park consists of 600,000 acres (2,400 square kilometres) that includes one-fifth of San Diego County. 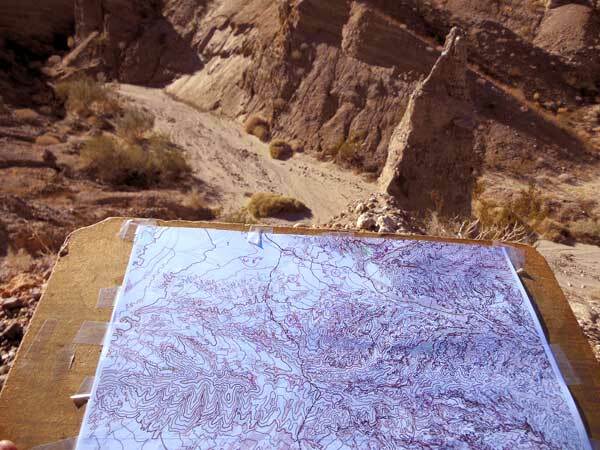 Anza-Borrego completely envelopes two towns--Borrego Springs and Shelter Valley--and contains 500 mi (800 km) of dirt roads, 12 designated wilderness areas, and 110 mi (180 km) of hiking trails. 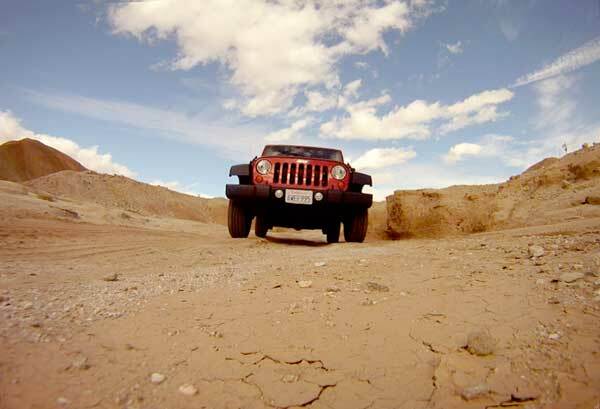 Anza-Borrego is around a two-hour drive northeast from San Diego. Many visitors approach from the east-Coachella Valley side via California County Route S22 and S78. It can also be accessed from the west-Pacific Ocean side via California County Routes S79 or S67 with the added experience of passing through the high and forested Laguna Mountains. 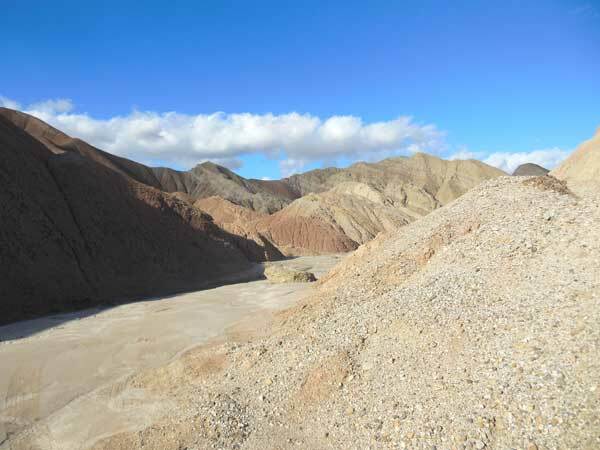 This drive climbs from the coast to 2,400 ft (730 m) above sea level, then descends 2,000 ft (610 m) down into the Borrego Valley in the center of the park.